Telomerase is expressed in the neonatal brain and also in distinct regions of the adult brain. We present a non-toxic time saving TRAP assay for the analysis of telomerase activity in various regions of the mouse brain and detection of differences in telomerase activity between male and female mouse brains. 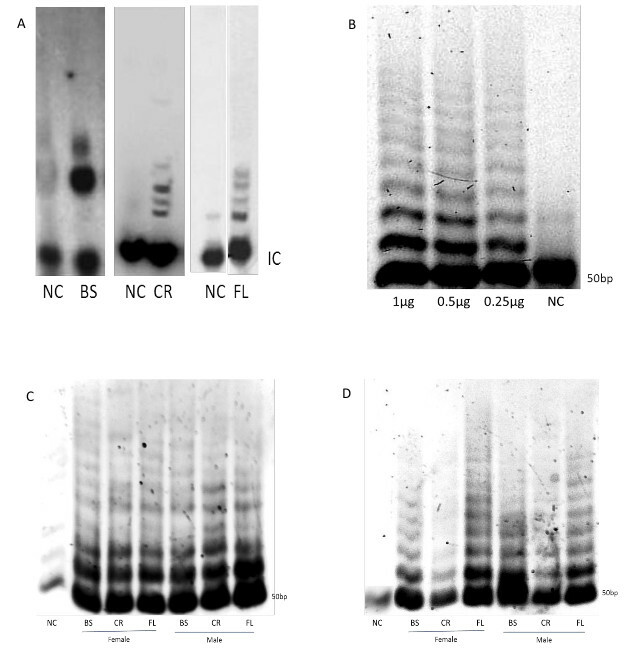 Grin, Y., Admoni, T., Priel, E. Telomerase Activity in the Various Regions of Mouse Brain: Non-Radioactive Telomerase Repeat Amplification Protocol (TRAP) Assay. J. Vis. Exp. (91), e51865, doi:10.3791/51865 (2014). Telomerase, a ribonucleoprotein, is responsible for maintaining the telomere length and therefore promoting genomic integrity, proliferation, and lifespan. In addition, telomerase protects the mitochondria from oxidative stress and confers resistance to apoptosis, suggesting its possible importance for the surviving of non-mitotic, highly active cells such as neurons. We previously demonstrated the ability of novel telomerase activators to increase telomerase activity and expression in the various mouse brain regions and to protect motor neurons cells from oxidative stress. These results strengthen the notion that telomerase is involved in the protection of neurons from various lesions. To underline the role of telomerase in the brain, we here compare the activity of telomerase in male and female mouse brain and its dependence on age. TRAP assay is a standard method for detecting telomerase activity in various tissues or cell lines. Here we demonstrate the analysis of telomerase activity in three regions of the mouse brain by non-denaturing protein extraction using CHAPS lysis buffer followed by modification of the standard TRAP assay. In this 2-step assay, endogenous telomerase elongates a specific telomerase substrate (TS primer) by adding TTAGGG 6 bp repeats (telomerase reaction). The telomerase reaction products are amplified by PCR reaction creating a DNA ladder of 6 bp increments. The analysis of the DNA ladder is made by 4.5% high resolution agarose gel electrophoresis followed by staining with highly sensitive nucleic acid stain. Compared to the traditional TRAP assay that utilize 32P labeled radioactive dCTP's for DNA detection and polyacrylamide gel electrophoresis for resolving the DNA ladder, this protocol offers a non-toxic time saving TRAP assay for evaluating telomerase activity in the mouse brain, demonstrating the ability to detect differences in telomerase activity in the various female and male mouse brain region. Telomerase is a ribonucleoprotein composed of telomerase reverse transcriptase (TERT), the catalytic subunit of telomerase, and a RNA component (TERC). The canonical role of telomerase is to preserve the proper length of the telomeres by adding repetitive sequences (TTAGGG) to the telomeric ends, therefore promoting genomic integrity, and cell proliferation1. Additional roles were attributed to TERT in cells, i.e. it confers resistance to apoptosis induced by various damaging agent2, protects human mesenchymal stem cells from oxidative stress3, and plays a pro-survival role in fully differentiated neurons by its association to TIA1 positive RNA granules4. TERT is expressed and active mainly in somatic dividing cells and in most types of cancers, while the enzyme expression and activity levels are tightly regulated in non-dividing cells5,6. Studies have shown that in the rodent brain, telomerase activity becomes undetectable by postnatal day 10, while TERT mRNA is maintained at lower levels into adulthood7. Other studies demonstrated telomerase activity within the adult sub-ventricular zone, the olfactory bulb, the hippocampus, and in the adult cerebellum and cortex8. We recently demonstrated that novel compounds that increase telomerase expression and activity in the brain and spinal cords exerted neuroprotective effects in N-Methyl-D-aspartate (NMDA) - injected mice, delayed the onset and progression of the amyotrophic lateral sclerosis disease in SOD1 transgenic mice and increased the survival of motor neurons in the spinal cord of these mice9. To fully understand the pro-survival role of telomerase in neurons and in the brain, it is essential to develop a simple and relatively sensitive fast assay for the detection of telomerase activity in the various regions of the brain. The telomeric repeat amplification protocol (TRAP) is a well-known sensitive assay combining the canonical activity of telomerase and the polymerase chain reaction (PCR). In this assay, telomerase adds TTAGGG repeats to a telomerase substrate (TS primer) oligonucleotide, followed by PCR amplification which generates 6 base-pairs (bp) DNA ladder using the TS reverse primer – ACX. 32P labeled dCTP’s are used to detect the low amount of PCR products. The DNA ladder is resolved by sequencing polyacrylamide gel electrophoresis (PAGE). Both the intensity of the DNA bands and the length of the DNA ladder reflect the amount of active enzyme molecules and their processivity respectively10. This traditional assay holds some major difficulties: The danger of exposure to radioactive substances, large and hard to handle sequencing PAGE and the time consumption of the gel running and film exposure of the radioactive product (overnight in both cases). This protocol offers an improved non-radioactive agarose mini-gel based assay. The DNA 6 bp ladder is resolved using 4.5% high-resolution agarose gel and the detection is achieved using highly sensitive nucleic acid stain. The combination of using high resolution agarose mini-gel and sensitive nucleic acid stain offers easy to handle assay, eliminates the danger of exposure to radioactivity and significantly shorten the overall assay duration from 3 days to several hours. Animal experiments were approved by the ethical committee for animal experiments in the Ben-Gurion University (IL-39-08-2010). Prepare 3 tubes of 15 ml each containing 5 ml Ringer's solution and place tubes on ice. Sacrifice the mouse using Isoflurane anesthesia (CAUTION – use chemical hood) for 10-20 sec followed by cervical dislocation and immediate decapitation. Remove the brain from the skull and rinse for a few seconds with ice cold Ringer's solution to prevent damage to the brain tissue. Using a surgical blade, separate the cerebellum (CR) and brainstem (BS) from the frontal cortex. Next, separate the cerebellum from the brainstem and cut the frontal lobe (FL) from the frontal cortex; remove the olfactory bulb from the frontal lobe. Place the 3 brain regions in the designated 15 ml tubes. Homogenize the tissue in each tube. Add fresh ice cold Ringer's solution so each tube contains the same volume and centrifuge for 7 min at 800 x g.
Remove the supernatant and add 100 µl of CHAPS lysis buffer to each tube. Mix well, by passing the solution several times (~10) through a 1 ml syringe with a 21 G needle, and incubate on ice for 30 min. Transfer the contents of each tube to a new micro-centrifuge tube and centrifuge for 30 min at 13,000 x g. Transfer the supernatant to a new micro-centrifuge tube and determine the protein concentration using a previously established method. Store the protein extracts in aliquots of 10 µl at -80 °C. Prepare appropriate number of labeled micro-centrifuge tubes for protein extract dilutions and telomerase reaction buffer. Perform all pipetting in the protocol using filter tips to prevent contamination. Thaw the following solutions on ice: TRAP reaction mix 10x, TS primer, dNTP's, UPW and protein extracts (see table of materials for reagents and reagents concentrations). Dilute the solution of the protein extract to a final concentration of 1 µg/µl using ultra-pure water (UPW). Prepare telomerase reaction mix by adding the following to a micro-centrifuge tube: 2 µl TRAP mix (10x), 1 µl TS primer (0.1 µg), 1 µl dNTPs (10 mM) and 15 µl UPW. For multiple samples, multiply aforementioned volumes by the number of samples, plus 1. Add 19 µl of the reaction mix to each reaction tube and add 1 µl of the diluted protein extract (1 µg proteins) to each tube for a final volume of 20 µl. Place the reaction tubes in a 30 °C pre-heated water bath for 45 min. Fifteen min before the end of the telomerase reaction, thaw the following solutions: ACX primer, Titanium Taq Buffer, UPW. Prepare PCR reaction mix by adding the following to a micro-centrifuge tube: 2.5 µl Titanium Taq Buffer (10x), 1 µl ACX primer (0.1 µg), 2 µl UPW (1 μl when IC is used) and 0.5 µl Titanium Taq Polymerase (50x). For multiple samples, multiply aforementioned volumes by the number of samples plus 2. Add 6 µl of the PCR mix to each PCR tube and add the entire volume of the telomerase reaction (20 µl) to each tube for a final volume of 26 µl. - 90 °C – 2 min. - 72 °C – 2 min. Store PCR products at -20 °C. Add 25 ml chilled electrophoresis buffer (TBE) and a stir bar to a beaker that is 2-4 times the volume of the buffer solution and slowly sprinkle in 1.125 g of the high-resolution (HR) agarose powder while the solution is rapidly stirred. Remove the stir bar, cover the beaker with a plastic wrap and pierce in a small hole for ventilation. Heat the beaker in the microwave on "Low" power for 3 min and then switch to "High" power and heat the solution in short pulses with care not to cause spilling. Note that when the foam created by heating becomes large bubbles and disappears after a few seconds, the agarose is ready. Cast the gel to a horizontal mini-gel apparatus, after the gel solidifies at room temperature allow the gel to chill for 20 min at 4 °C before use. Load each lane with 25 µl of TRAP sample (20 µl TRAP PCR products and 5 µl 6x gel-loading dye) and run at 110 V for 3 hr in a 4 °C cold room. Prepare nucleic acid stain 3x working solution by adding 15 µl 10,000x nucleic-acid stain, stock solution to 50 ml Double Distilled Water (DDW) with 0.1 M NaCl (0.29 g). Stain the gel for 20 min with gentle shaking. Use UV transilluminator with 302 nm wavelength to view the TRAP ladder DNA bands. Whole cell protein extracts were prepared from the frontal lobe (FL), brain stem (BS) and cerebellum (CR), derived from 3 CD-1 female and 3 CD-1 male mice at the ages of 1 and 3 months old for the modified TRAP assay and 3 CD-1 male mice at the age of 2 months old for the radioactive TRAP assay. Telomerase activity was detected in 1 µg proteins extract using the modified TRAP assay and 2 µg proteins extract for the radioactive TRAP assay. Detection of telomerase activity by the radioactive TRAP assay and by the modified TRAP assay shows that a better visualization and resolution of the telomerase DNA products is observed with the modified assay as seen by the length and intensity of the DNA ladder (Figure 1A vs. 1C and 1D). A gradual reduction in the telomerase DNA products is observed when decreasing concentrations of protein extracts, derived from glioblastoma U-251 cell line, was used suggesting the sensitivity of the modified TRAP assay method for the detection of telomerase activity at lower concentrations of proteins extract (Figure 1B). A significantly higher telomerase activity is seen in the FL and BS regions compared to the CR in 3 month old females and males as revealed by the intensity of the DNA bands and the length of the DNA products ladder. In addition, it is shown that during the mouse transition into adulthood telomerase activity increases in the FL and decreases in the BS and CR (Figure 1D). Comparison between the sexes demonstrates that in the FL telomerase activity is higher in females in contrast to the BS and CR showing higher telomerase activity in males. In tissues expressing low levels of telomerase activity we have found that the detection of the DNA ladder using PCR is more efficient without using the internal control (IC) primer, since the IC utilizes the TS as a forward primer thus interfering with the DNA ladder amplification. The reproducibility of the data is achieved by repeating each experiment several times. Figure 1. Telomerase activity in the mouse brain: Traditional versus modified TRAP assay. A) Telomerase activity in 3 brain regions analyzed by radioactive TRAP assay (2 months old CD-1 male mice, 2 µg proteins extract). B) Sensitivity of the modified TRAP assay is shown by decreasing concentrations of the proteins extract derived from glioblastoma U-251 cell line. C, D) Telomerase activity in 3 brain regions of 1 (C) and 3 (D) months old CD-1 female and male mice. The DNA ladder starts at the 50 bp band with 6 bp increments. (NC - negative control, IC- internal control, BS – brain stem, CR – cerebellum, FL – frontal lobe). Analysis of telomerase activity in the mouse brain via the TRAP assay consists of 4 major steps: 1) proteins extraction from specific regions of the brain tissue 2) TS primer elongation by telomerase - telomerase reaction 3) amplification of the telomerase reaction products by PCR 4) separation of the PCR products using high resolution agarose gel. This modified TRAP assay addresses two major difficulties that rise from the traditional assay: the use of radioactive dCTP's for sensitive detection of the PCR products and PAGE separation of the DNA ladder. High resolution agarose gel simplifies the detection of the telomerase reaction products (the DNA ladder) compared to the hard to handle sequencing PAGE. In addition, the nucleic acid staining is a non-toxic solution with high sensitivity needed for the detection of small amount of DNA. Special attention should be given to the following critical steps: 1) keeping the time between tissue removal and homogenization to a minimum to preserve protein integrity 2) CHAPS lysis buffer refreezing should be avoided 3) protein extracts should be kept in aliquots and thawed once before use. Avoid refreezing of samples. Problems may occur during the gel preparation step since high concentration agarose gel is prone to spillover and requires close attention during cooking. The technique holds several limitations with the necessity of running the gel in a cold room. In addition, the low amount of PCR products cannot be viewed on a UV table. Telomerase activity level varies among different tissues and is considered to be low in the brain. This protocol offers a more sensitive detection method, compare to the traditional radioactive assay enabling better detection of telomerase activity in the brain. Although different time-efficient methods are available (one step TRAP assay kits, using a labeled TS primer for detection) these methods are significantly more expensive. Moreover, the use of agarose eliminates the toxic hazard of using polyacrylamide gel. As revealed from the representative results, by using the above described method, it is possible to demonstrate the differences in telomerase activity levels between the various regions of the brain and between male and female. This method can be used for the detection of telomerase activity in other normal tissues with low telomerase activity. This work was partially supported by B.G. Negev technology and Linda Powers's contribution. TRAP Mix (10x) Made manually, mix the following in UPW: 630 mM KCl, 200 mM Tris-HCl pH 8.2, 10 mM EDTA, 15 mM MgCl2, 1 mg/ml BSA, 0.5% TWEEN (purchased from Sigma). Aliquots are frozen at -20 °C. Ringer's solution Made manually, mix the following in DDW: 124 mM NaCl, 3 mM KCl, 1.25 mM NaH2PO4·H2O, 2 mM MgSO4, 26 mM NaHCO3, 1.802 g/L D-(+)-glucose anhydrous. CD-1 mice HARLAN Laboratories INC.
Urquidi, V., Tarin, D., Goodison, S. Role of telomerase in cell senescence and oncogenesis. Annu Rev Med. 51, 65-79 (2000). Cong, Y., Shay, J. W. Actions of human telomerase beyond telomeres. Cell Res. 18, 725-732 (2008). Tichon, A., et al. Oxidative stress protection by novel telomerase activators in mesenchymal stem cells derived from healthy and diseased individuals. Curr.Mol. Med. 13, 1010-1022 (2013). Lannilli, F., Zalfa, F., Gartner, A., Bagni, C., Dotti, C. G. Cytoplasmic TERT associates to RNA granules in fully mature neurons: Role in the translational control of the cell cycle inhibitor p15INK4B. PloS one. 8, e66602 (2013). De Jesus, B. B., Blasco, M. A. Potential of telomerase activation in extending health span and logevity. Curr opinion in Cell Biology. 24, 1-5 (2012). Blackburn, E., Collins, K. Telomerase: An RNP enzyme synthesizes DNA. Cold Spring Harb Perspect Biol. 3, 1-9 (2011). Klapper, W., Shin, T., Mattson, M. P. Differential regulation of telomerase activity and TERT expression during brain development in mice. J. Neurosci. Res. 64, 252-260 (2001). Caporaso, G. L., Lim, D. A., Alvarez-Buylla, A., Chao, M. Telomerase activity in the subventricular zone of adult mice. Mol. Cell Neurosci. 23, 693-702 (2003). Eitan, E., et al. Novel Telomerase-increasing compound in mouse brain delays the onset of amyotrophic lateral sclerosis. EMBO Mol. Med. 4, 313-329 (2012). Kim, N. W., Wu, F. Advances in quantification and characterization of telomerase activity by the telomeric repat amplification protocol (TRAP). Nuc. Acid Res. 25, 2595-2597 (1997).